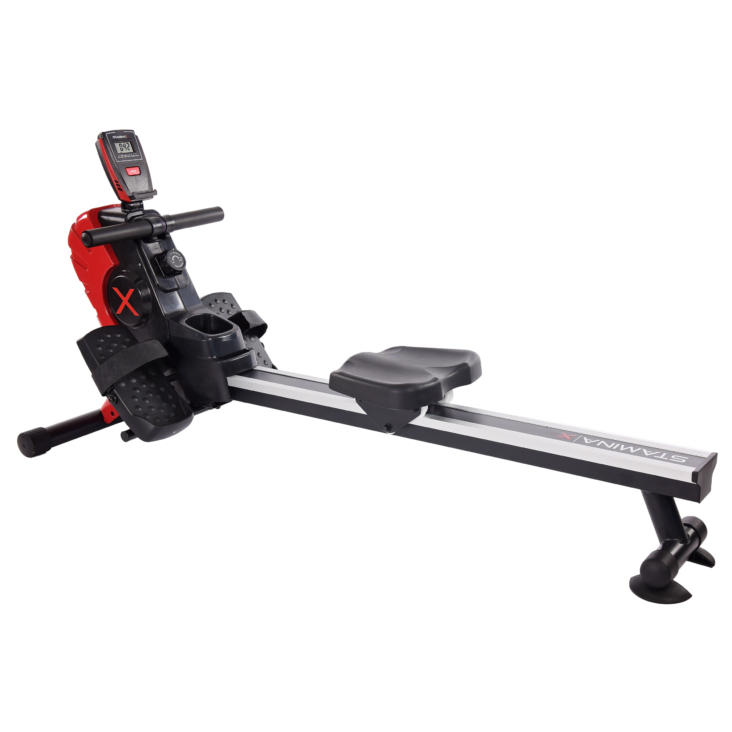 Built for advanced performance and total-body cardiovascular workout, the Stamina X Magnetic Rower will allow you to achieve your fitness goal with its 8 levels of magnetic resistance. The simple tension dial makes it easy to change intensity even in the middle of your workout. It boasts a multi-function monitor that displays total strokes, strokes per minute, workout time, distance and calories burned. This rower is equipped with aluminum channels on the rowing beam so the fully-padded and molded seat can slide smoothly. Plus, it has foam rowing handles for secure and comfortable grip. No need to worry about long hours of workout as it features a durable rowing strap that’s built to last and can withstand even your most intense routines. The pivoting footplates allows a larger range of motion and the adjustable straps will secure your feet during push-off and return. The Stamina X Magnetic Rower, in vibrant color red, also comes with durable built-in wheels for convenient storage and mobility. The machine works smoothly and quietly so it is perfect for home use. As a bonus, this rower also includes a holder for your drinks and smartphone, so everything you need is within reach. With these advanced features, you’re going to want to row day in and day out. TRACK YOUR PROGRESS - This row machine features a multi-function workout monitor that displays total strokes, strokes per minute, workout time, distance and calories burned. BUILT FOR COMFORT AND CONVENIENCE - Equipped with aluminum channels on the rowing beam so the fully-padded and molded seat can slide smoothly. This rowing machine also comes with built-in wheels for convenient storage and mobility. PHONE AND DRINK HOLDER - As a bonus, this indoor rowing machine includes a holder for your drinks and phones to make your workout more enjoyable. Improve cardiovascular health. Full-body strength training. High intensity interval training. HIIT.